Animals in space: What does it take to be tasked with exploring the Universe before humans? Five geckos sent into space in June didn’t survive the trip back to Earth. They join a list of fondly remembered animals whose lives have furthered our understanding of the Universe. Before the geckos, most animals that Russia had sent into space had been dogs. The five geckos were sent into space on the Photon-M4 satellite in June for Russian scientists to study the effects of weightlessness on their libidos. They were chosen for this study by Moscow's Institute of Medical and Biological Problems, because their resilient metabolisms (and sticky feet) would allow them to cope with the alien conditions during the two-month journey. But the satellite returned to Earth with no survivors or new generations on board. The scientists were so distraught at the lizards’ deaths that they vowed to never again send geckos into space. Russia’s space agency Roscosmos set up an emergency commission to establish why the lizards perished, concluding that a technical mistake led to them freezing in their life-support systems. This wasn’t Russia’s first cosmic breeding experiment. For over a decade the Mir space station ran the Priroda (Nature) module, where in 1990 the first quail chicks were born. They could not adapt to weightlessness and soon died, although a couple of them survived the return to Earth. Before the geckos, most animals that Russia had sent into space had been dogs. Mice, rats and guinea pigs were only useful for experiments in labs, whereas monkeys, despite being so biologically similar to humans, adapt very slowly to new conditions. America sent rockets into space carrying monkeys that had been drugged, but Russian scientists argued that this devalued the experiment, as narcosis “switches off” the cerebral cortex. Soviet programs used homeless dogs for their missions. In 1960 two such strays named Belka and Strelka spent a day in space on Sputnik 5. Nikita Khrushchev presented one of Strelka’s puppies to the family of John F. Kennedy during a thaw in the Cold War and Belka and Strelka have recently been the inspiration for a children’s animated film. A test flight with another dog, Zvezdochka (Little Star), on board was launched the month before Gagarin’s departure. When she landed back on Earth in a village near Perm, she disappeared from her capsule. The search party eventually found Zvezdochka in the house of a local man who had taken her home to feed her. She now has a statue in her honor in the city of Izhevsk. However, not all space dogs had a happy end. 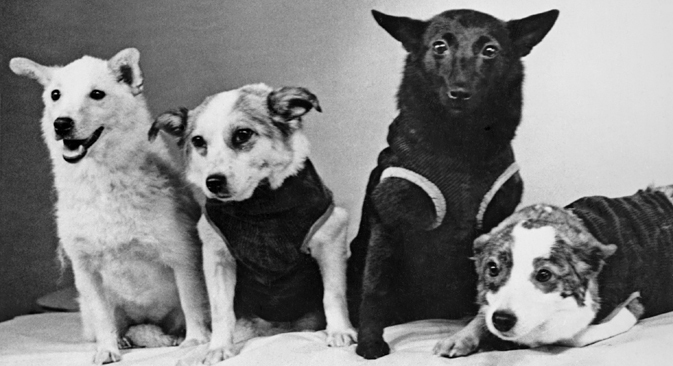 The Soviet Union first sent dogs into space in 1951 from the Kapustin Yar launch pad. The rocket Р-1B, carrying Dezik and Tsygan, ascended to 88 kilometers. The front part of the rocket then separated from the back with the dogs still inside, and with the help of a parachute the capsule landed close to where it had been launched from. Dezik and Tsygan were both alive and in good spirits. There was another launch a week later with Dezik joined by a new partner, Lisa. But this time their capsule’s parachute failed to open and both dogs died. Immediately after the tragedy Tsygan, who had survived the first flight, was adopted by the head of the project, an academic named Blagonravov. Henceforth cosmic pups born to space-travelling dogs were given to officials in the USSR as medals for outstanding service. In 1957 another tragedy occurred. In honor of the 40th anniversary of the Soviet revolution, it was decided to send a satellite into orbit with a living creature on board. Previously dogs had only been sent into space in rockets and only for short periods of time. Photographers recommended that a white dog be chosen as they look better on screen. The scientists only had three suitable candidates: Albina, Laika and Mukha. Albina was pregnant and Mukha had slightly crooked paws, which made her less photogenic. When Laika died the Kremlin received letters from the USA and Europe protesting the Soviet Union’s cruel treatment of its animals and suggesting that Soviet leader Nikita Khrushchev be rocketed into space instead. The real reasons for Laika’s death were only revealed 45 years later. At a congress in Houston a researcher at the Institute of Medical and Biological Problems, Dmitry Malashenkov, revealed that she had died only a few hours into the journey from stress and overheating. Laika’s story still moves people today. People write blogs in her name, Russian fantasy writers feature her being saved by aliens and rock groups have written songs for her. By the spring of 1961 the Soviet Union launched 29 rockets. They carried 48 dogs, of which nine travelled into space. Many of them took several successful journeys, but 12 of the 48 did not make it back alive.